What seems to be debris from the Malaysian Air flight MH370 that mysteriously vanished in March 2014 has washed up on on the island of Réunion in the western Indian Ocean. Investigators from Boeing are still figuring out whether the flaperon (the technical name for the piece of airplane wing) is from the missing plane, but it seems very likely that it is. Réunion is practically on the the other side of the Indian basin from where investigators think the missing airplane may have gone down. So how did this chunk of airplane get all the way over there? Short answer: it was pushed by currents, winds and waves. From my physical oceanography perspective, I am going to discuss here what scientists and investigators thought the ocean would do to debris from a possible wreck, what the ocean actually did and what happened to the debris along the way. What we thought the ocean would do. Numerical models, also known as electronic oceans inside your computer, are used to predict where currents, winds and waves will push marine debris. In this case, a model run by Charitha Pattiaratchi from the University of Western Australia was used to estimate the trajectories of crash debris as they were spread out by ocean currents and to figure out where they will end up. And that giant squiggle of red debris trajectories located just east of Madagascar are positioned right on top of Réunion! Of course, this is just a prediction and the timing is a little off since it’s only been 18 months since the crash. This mismatch probably occurred because the model was likely run with historical surface current data and idealized numerical debris, although I couldn’t find any details on the model itself (if anyone knows please send me a link in the comments!). And even though I think Prof. Pattiaratchi oversells his model by saying it “exactly predicted where the debris would go” (if it’s so accurate why hasn’t any debris been found on Australian and Tasmanian beaches? ), there are enough realizations to show that debris from the crash would have likely ended up on the tiny isolated bump in the big blue sea called Réunion. So in some ways it’s not surprising that the flaperon washed up there and it’s also likely that more debris will too. And this one shows that the flaperon found on Réunion most likely came from the northern region of the search area. Hydrodynamic experts Maarten van Ormondt and Fedor Baart from Deltares used surface currents from the HYCOM model to track where marine debris might have been carried by currents in the 14 months since the crash. Particles released really far south never made it to Réunion in a year, while those released farther north did! This model more accurately tracks marine debris than the previous model because it incorporates real oceanographic data since March 2014 to estimate realistic surface currents, rather than making a prediction using historical data. That being said, predictive models are still really important! They help dictate where investigators should have searched before the debris were found, as was the case until last week. What the ocean actually did. Every news outlet seems to love posting the latest images from earth.nullschool.net to show the currents in the Indian Ocean. Why not? I love that site and the graphics are pretty! But the problem is it only shows a snapshot of the latest 5 days and is not at all indicative of the mean flow that pushed the debris across the Indian Ocean. To do that, we need to look at the average currents since the plane disappeared to get a better grasp on exactly what pushed debris to Réunion. Average surface currents since the disappearance of MH370. Colors have been Zissoufied and indicate current speed. Arrows show current direction and larger arrows = faster currents. The most obvious feature in the graphic above are all the arrows pointing westward just south of the equator around 10-15° S. It’s called the South Equatorial Current (we oceanographers are very creative in our naming schemes). Debris from the aircraft got caught up in this flowing water and were likely pushed across the Indian Ocean smack dab onto Réunion. But it’s a little more unclear in this image how the debris got north from the search area into the South Equatorial Current. The culprit? The West Australian Current that flows northward along Western Australia. You can’t see it too clearly here, because there is a lot of small scale eddies that mess with the averages. But if you look at a even longer term averages, it’s there. The debris probably just took a very squiggley northward path until it reached the South Equatorial Current. Both the South Equatorial Current and the West Australian current are part of the larger Indian Ocean gyre, a giant rotating vortex of water in the southern Indian Ocean. Some of the debris, if they manage to float that long, may even end up back on the Australian coast because of the gyre! I should also note that the debris was found about 4400 km away from where the plane might have gone down and it’s been about 505 days since the plane disappeared. Making a rough calculation with my TI-85, that means the drift speed of the debris needs to be about 0.1 m/s or ~5 miles a day to get to Réunion from the search area. That’s pretty close to the current speeds in the plot above so it’s totally plausible that this debris is from the crash. What happened to the debris as it drifted. Anything that has been in the ocean for more than a year will have some sort of sea life clinging to it, and this piece of wing is no exception. Look at all those gooseneck barnacles! 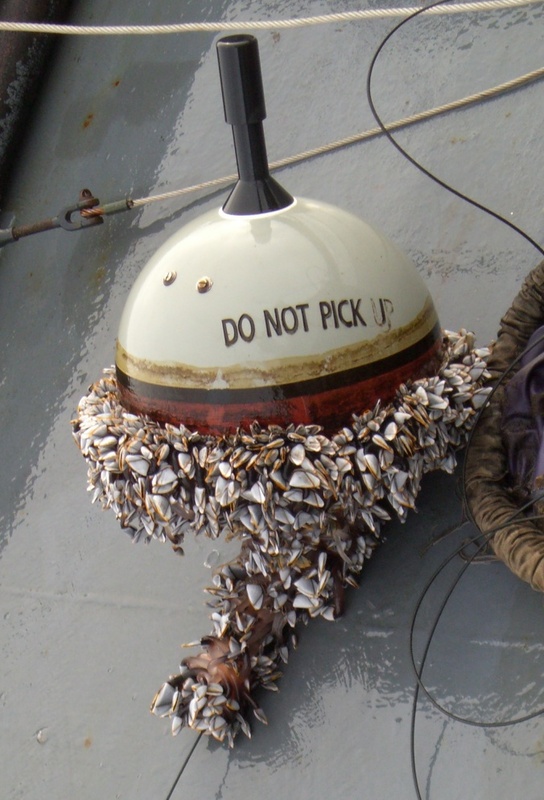 Resident DSN barnacle expert Miriam Goldstein has informed me that this amount of barnacles could easily grow on the flaperon in the 16 months it has probably been out at sea. I’m actually a little surprised more hasn’t grown on it. She also notes that they are from the Genus Lepas, although she can’t identify the species from the photo. The barnacles don’t seem to preferentially growing on one side, which also leads me think that this piece of debris was mostly submerged while drifting. The search for answers regarding the plane’s disappearance has been a long and difficult one. More debris from the wreck could end up on Réunion or at least near it in the future, if it has not already. Even though we found pieces of the plane, we can’t pinpoint exactly where the plane went down as suggested by some media outlets. But there might be clues in the debris itself to at least indicate what caused the plane to veer so very far off course and disappear. My hope is if investigators can find more debris, they can figure out what happened to MH370 in the first place and finally give the families of those onboard the tragic flight can find some answers and peace. Share the post "How currents pushed debris from the missing Malaysian Air flight across the Indian Ocean to Réunion"
MH370 and the proverbial haystack. does anyone here think Pattiarachi, who’s been studying the area for probably 30+ years, might know a little more than a recent graduate located in a completely different area with clearly little if any direct knowledge of the Indian Ocean? I’m sure he does know more about the Indian Ocean than I do! But no model, no matter how good it is, can “exactly predict” where the debris would go. I just had a look at your article on Indian ocean currents and the effects it my have had on the wreckage of flight MH370. I agree with most of your findings on the movement of water around the Indian Ocean but one I’m not sure of. On May 2013 a 8 metre Leisure Cat fishing boat capsized of Exmouth WA Australia and was lost. After only 8 months it washed up on the Island of Mayotte in between Madagascar and Africa. The time it can take is a lot less than in your article, so I hope this can help. I am surprised that everyone is now looking at Reunion, looking at the pattern of the South Equatorial Current is it far more logical to find debris on Mauritius (which is also larger than Reunion) Tromelin, Chucuito, Cargados Carajos or any of the other smaller atols. Actually Reunion is the last of the chain. Investigators had the exact same idea! They are just starting to look in those regions as well. It might have just been easier to initially find the flaperon on Réunion as there are no fringing reefs capturing debris before washing ashore on beaches frequented by humans. Shouldn’t we find some on Diego Garcia too that may have landed monthes ago? I wouldn’t be surprised if they found some there. Then again I also wouldn’t be surprised if they didn’t. There are so many factors that determine whether or not marine debris end up washing on land. There is another possibility as when MH370 went West it may have continued in that direction as there was a sighting of a large jet flying suspiciously low over the Maldives (engines howling…possibly low on fuel) that may have been MH 370 and if it crashed 100-200 nautical miles South to SW of the Maldives the currents from there would also send debris on the SW current from there to Reunion Island. The only evidence against this is the satellite data that indicates it crashed in the vicinity of the main search region.